Why not try growing hyssop, lovage and summer savory? Interesting article about 3 herbs not often used but great for cooking and easily grown in our gardens; hyssop, lovage and summer savory. If you have a space for growing herbs in your garden definitely worth considering! An interesting garden design is to be built in Leeds for a new Maggie's Centre at the Leeds Cancer Centre, St James Hospital in Harehills. £5.1 million has been raised for the building and gardens with construction now underway, due to be opened in Autumn 2019. 1. Prune deciduous summer-flowering shrubs such as late clematis and buddleias, and fruit trees, before the sap starts to rise and the buds break. Cut out anything that's dead, diseased or damaged. 2. Prune winter-flowering shrubs that have finished flowering. 3. Prune hardy evergreen hedges and renovate overgrown deciduous hedges. 4. 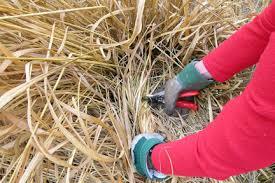 Cut back any remaining perennial dead stalks and leaves and clear up any debris left on the soil.